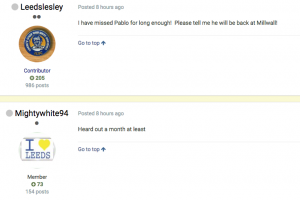 A section of Leeds United fans have taken to Twitter to express their dismay as speculation intensifies that Pablo Hernandez could be sidelined for a month. The attacking midfielder was expected to be back in training this week after pulling out of United’s clash against Middlesbrough before the international break with a minor muscle problem. But it was claimed on the Leeds Facebook forum WACCOE last night that Hernandez will be out until the middle of October, and this was then reported by a number of others on social media. Many United supporters are highly concerned given that the information is coming from credible sources. The Leeds fans are sweating at the prospect of losing Hernandez for a month. The Spaniard has begun the season in outstanding form after adapting superbly to a new right-flank role and was named the PFA fans player of the month for August. He was sorely missed against Boro, when United lacked the creativity to break down a well-drilled back line. Hernandez is said by supporters on social media to have sustained an injury in training this week and, while that has not been corroborated yet, it is being treated seriously by many senior Leeds followers. What a blow that would be, especially after it was confirmed earlier this week that £7million summer signing Patrick Bamford is out for four months with a serious knee injury sustained playing for the Under-23s last weekend. Hernandez turned 33 earlier this year, but is playing better than ever and losing him would be a critical blow. Harrison is class, he just needs to get the confidence back from his spell at NYC. Still, Hernandez is a big loss if he's out for that long. FFS. Any idea what the injury is? Though nobody expected Pablo to play anywhere near 46 games this season, when fit, still think he's our most influential player.